Chocolate brownies are flat, baked dessert squares and have so much going for them, great flavour, easy to make, and so versatile. 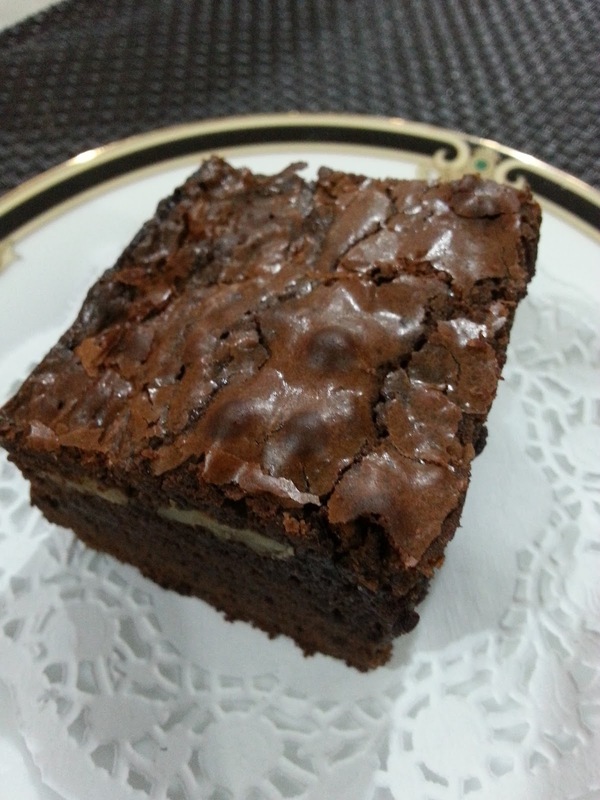 The simplest brownies are made with just melted chocolate, butter, sugar, eggs, vanilla and flour. Delicious of course, but you can also take a brownie to the next level by adding a layer of frosting. Depending on its density, it may be either fudgy or cakey and may include nuts, icing, chocolate chips or other ingredients. 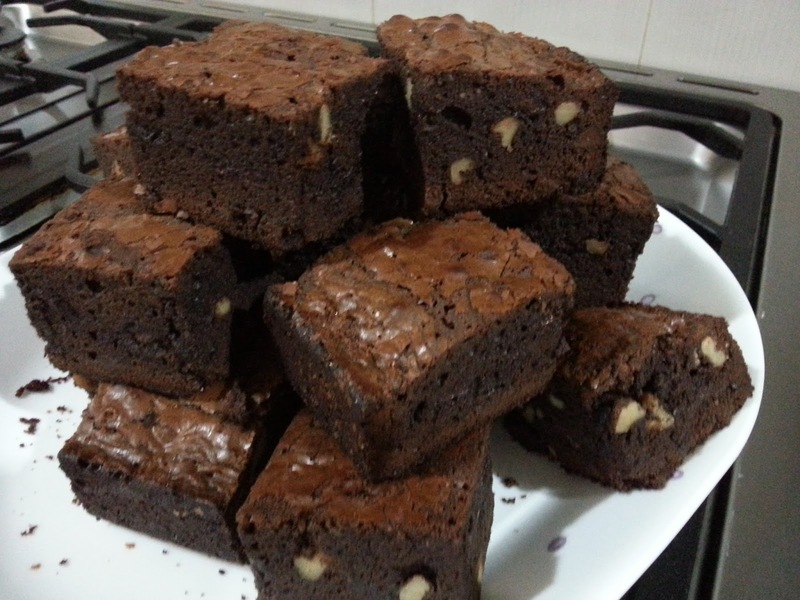 A variation made with brown sugar and chocolate bits but without melted chocolate in the batter is called a blonde brownie. 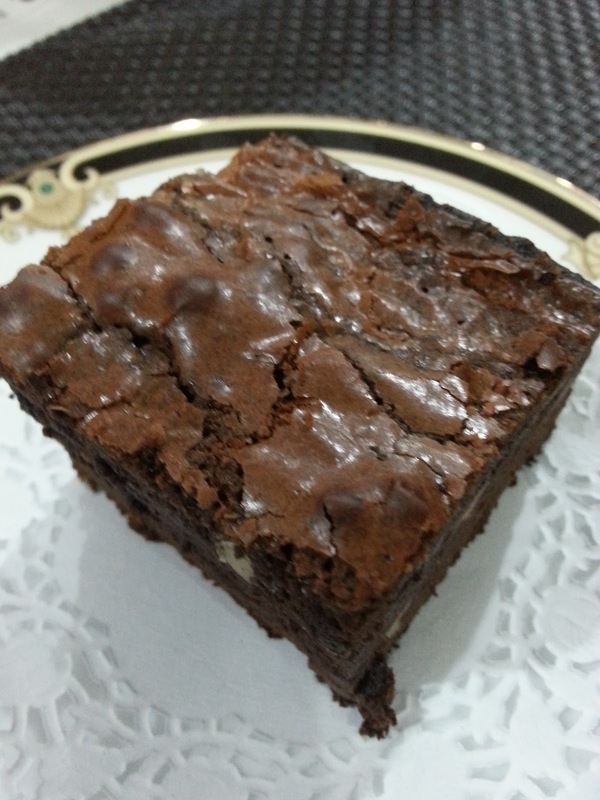 Having tried making these brownies last night from this lovely recipe by Martha Stewart, I was simply pleased with the result especially when it was my first try. 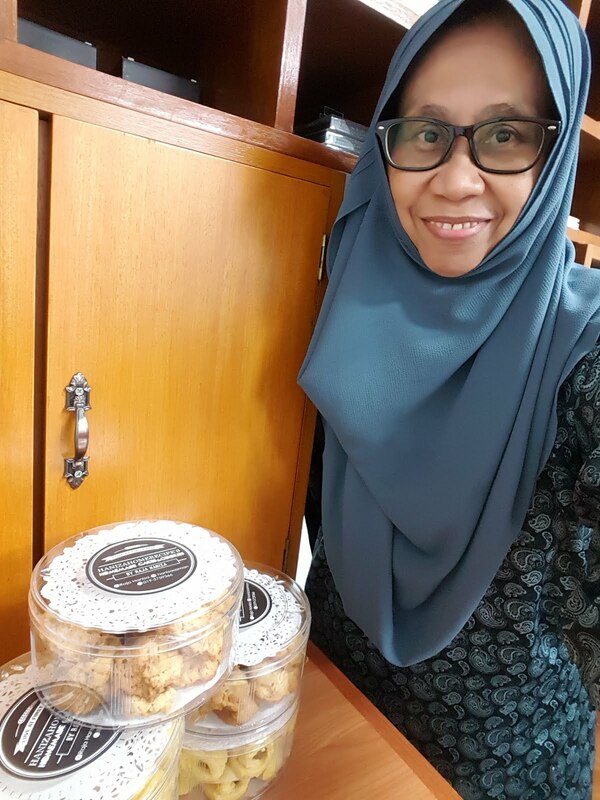 I have wanted to do this before but kept postponing it each time until I decided to try doing them because I wanted to bring something for a niece, Nuroll Azrin's Raya Open House this evening in KL. My efforts did not turn to waste as I was so very happy that they turned out to be simply amazing so chocolaty and so nutty (next time I have to add in more walnuts though). 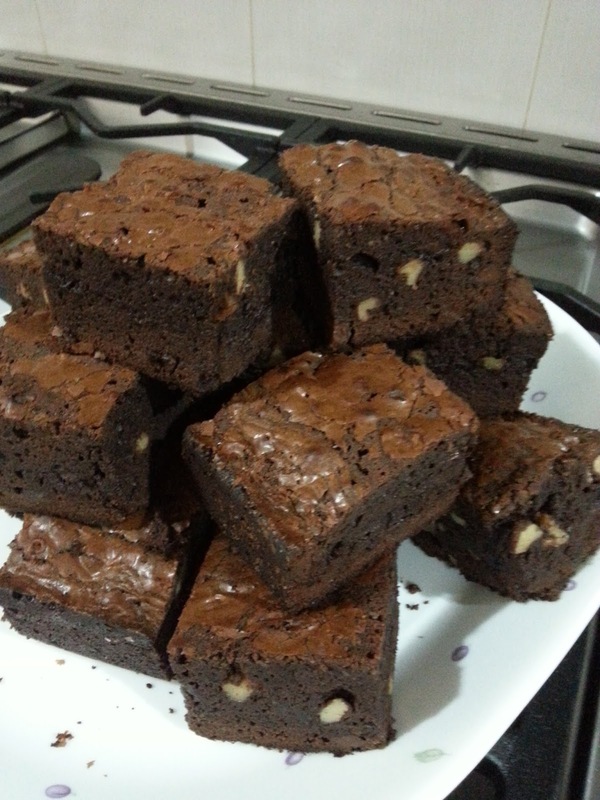 To you who would like to try making them, I can recommend you this recipe as I have done these brownies myself and they were simply awesome. I should have made some chocolate frosting as toppings and sprinkle more chocolate chips and walnuts which would definitely be so so rich and fantastic, maybe my next round of brownies, but with or without frosting, they are surely good. When you look at them, tell me, dont you think they look too good to resist to not making them? Preheat oven to 170 degrees celcius. Brush a 9-inch square baking pan with butter. Line bottom and two sides with a strip of parchment paper, leaving a 2 inch overhang on the two sides. Butter paper, and set pan aside. In a small bowl, whisk flour, cocoa, baking powder, and salt; set aside. Place butter and chocolate in a large heat-proof bowl set over (not in) a saucepan of gently simmering water. Heat, stirring occasionally, until smooth, 2 to 3 minutes; remove bowl from pan and let cool. Add sugar; mix to combine. Add eggs and vanilla extract and mix to combine. Add flour mixture; mix just until moistened (do not overmix). Add chocolate chips and walnuts. Transfer batter to prepared pan and smooth top. Bake for about 40-50 minutes until a toothpick inserted in centre comes out with a few moist crumbs attached. Cool in pan for 30 minutes. Using paper overhang, lift brownies out of pan; transfer to a rack to cool completely (still on paper). On a cutting board, using a dampened serrated knife, cut into 16 squares. Store in an airtight container at room temperature, up to 2 days.